The name Oldcastle rang a bell with me, but it wasn’t until I Googled it that I remembered some research I’d done about a year ago on the background surrounding Shakespeare’s Henry IV. Richard Oldcastle  was captain of Aberystwyth from 1411 to 1422 ; although the linked document mistakenly identifies him as the father of a man called John Oldcastle, I think it’s much more likely that Richard was his brother – especially since they appear to have been born within a decade of each other, rather than a generation apart. The Oldcastles were an important Herefordshire family from Almeley, but one particular member; the John Oldcastle, brother of Richard mentioned before, has been recorded in history in a rather exceptional way. This is because John Oldcastle was a great friend to Prince Henry, later Henry V, a king who in the end had to order his old friend to be executed due to numerous treasons and treacheries. It was this John Oldcastle who was the basis for Shakespeare’s John Falstaff, and it seems very possible that he himself could have come to Aberystwyth to visit his brother’s new castle. For two years after his brother was granted Aberystwyth Castle, John was happily engaged in court affairs, and could easily have visited Richard and watched him organise his new commission. After 1413 things got complicated for John, as he was instigated in accusations of heresy and was forced to go into hiding. It was four years before he was captured in Herefordshire, not far from the Welsh border. He certainly kept in contact with different members of the nobility, since he was able to attempt numerous plots against the king as well as keep up with what was going on in the royal court. It could be possible then that in old John’s flight from the king and his resulting four years of roaming the countryside in and around Wales, that he made the odd visit to his brother carrying out duties at the remote town of Aberystwyth, where it wouldn’t be too hard for a man wanted by the king to sneak in unknown. Yes, more speculation than history, sorry about that. I was just excited that one of my favourite characters out of Shakespeare’s works could have visited this little town! After two weeks of no internet, I thought as sensibly as to come up the hill and post from there. So, rejoice, for here is more history (although, I’ll admit, a little more theory than anything that I can prove). Aberystwyth has been since very early times a market town, although its originally meagre size and lack of local towns meant that the early markets were not particularly grand affairs. However, by the fifteenth century with the pacification of Wales, Aberystwyth began to become more relaxed and the interests of local noble families began to bring more and more goods into the town. Markets would be overseen by the local authorities from a ‘Guild Hall’, a meeting place, usually near or within the market, which would often consist of an open ground floor where traders could come and go with a large hall above. They would act as an early form of a town hall, occasionally also containing such things as stocks, jail cells, and in some cases were even put to use as early court rooms. But why am I filling this sparse space of internet with this information? 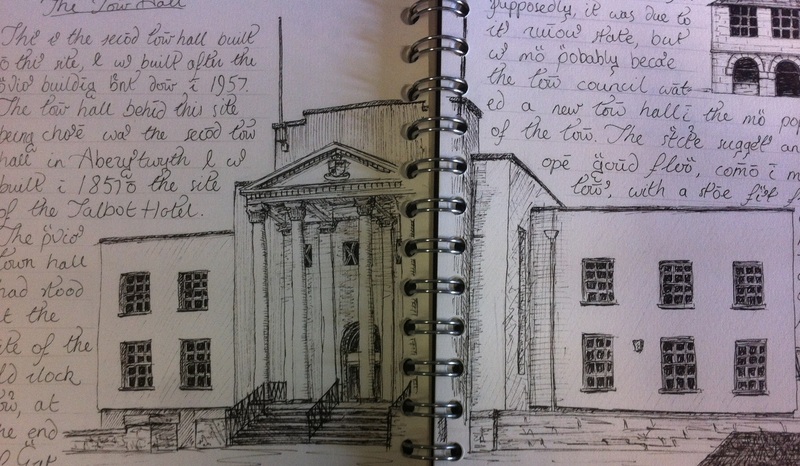 Well, kind reader, may I put forth my theory of what became of Aberystwyth’s medieval guild hall. This is our modern town hall, or at least it was until recently. It was originally built in 1857 and burnt down exactly a hundred years later, after which this building based on the previous one was put up. 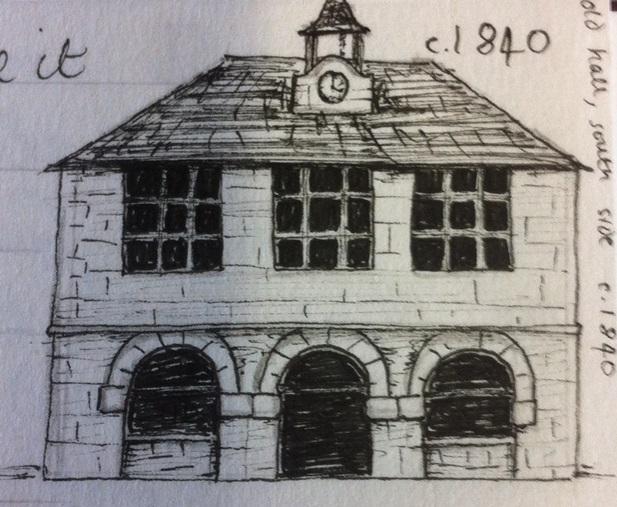 The town hall that existed before 1857 stood at the top of Great Darkgate Street, on the spot where the clock tower is now, and was supposedly built in about 1690, since its first recorded use was in 1693. 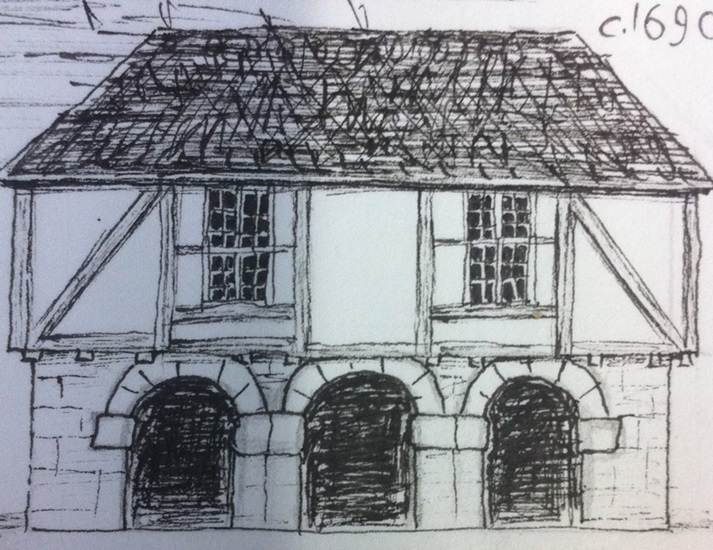 It wasn’t until I came to draw it in my sketchbook that I realised the ground floor resembled surprisingly the open plan ground floor that you’d expect of a medieval guild hall. Two of the arches appear to have later been blocked up, but could it be that this early town hall was not at all built in the 1690s, but was simply an older building that had been given a new name by the local authority. It does resemble very greatly many medieval guild halls. It’s also in the right place – right at the head of the street, where the main market was, and not far from the meat market just a little further down Great Darkgate Street. Also, if the old town hall was actually a requestioned guild hall, then that would explain why there are no documents recording it being built. So, could it be that the last medieval building in Aberystwyth – a medieval guild hall that had survived the destruction of the castle, the following ruin of the whole town’s economy, and the modernisation of the early nineteenth century – was only pulled down in 1855 for want of a new town hall. The history of a font face (yes, it is true, that is what I intend to write here) is something that I certainly had never really considered. But my recent acquisition of some extraordinarily old papers* has toppled my previous indisposition towards the history of type, and has brought me up to a world of history far more fascinating than I could imagine for those particular Roman typefaces. Times New Roman is, supposedly, the most widely used typeface in history; from books, to newspapers, to websites, to essays, it has become not only a staple of the British page, but has surely influenced the very way we see and understand letters. Going back six hundred years, Roman font faces would have seemed alien to the literate population of the time; the confusing array of regional black letter styles acting as a barrier themselves to reading the information they tried to record. How, then, did the whole of Europe change so much from that long established traditional style to the modern fonts we use today? To begin my history of a font face, we need to go back to the civilization that bears its name; the Romans. Although several English letters don’t occur in the classical Latin that the people of Rome knew, the style of font face, called Serif, really flourished there and commonly appeared on carvings (although it actually has a basis in the even older Trajan scripts). The term Serif (actually a modern term that people decided to start using in about 1800) comes from the characteristic lines attached to the ends of the main strokes of each letter. There’s several theories about why they were originally there – and yes, still here two thousand years later in our Times New Roman – but the presiding one at the moment is that they were originally flicks that occurred when the text designs were painted onto stone as stencils to be carved out. These flicks quickly became stylised, were pleasing to those ancient eyes, and have stayed ever since! The Roman fonts spread throughout that ancient empire; even the illiterate Iron Age populations would have seen the style on the great public monuments that the Romans brought with them. These survived for the duration of the empire, until about the fifth century, when changing styles began to shift handwriting into a more rounded, simple style called Uncial. Unical; the writing that developed out of the ruins of the Western Roman Empire. By the 9th century, Uncial had developed into Carolingian, which had slightly more similarities to our modern lower case letters. (It was also one of the inspirations for the Hobbit style of handwriting Tolkien wrote about.) It was developed by several centres of learning across the Holy Roman Empire so that it would be easier for people to read books previously written in odd regional styles. Carolingian; a writing created to make it easier for different parts of the Holy Roman Empire to communicate. Then, by about 1200, things started to go a bit wrong. The unity of handwriting that had spread across most of Europe with Carolingian for some reason broke down, and Blackletter began to develop, with its own characteristics appearing from region to region. So, how did we go from this move away from any kind of Roman font to having every usual font we use today derived from Roman styles? By the beginning of the fifteenth century, there was an eclectic array of Blackletter handwriting across the literary houses of Europe; the renaissance was a growing power and an obsession with all things Roman was just getting going. So it came to be in Italy, the heartlands of Roman antiquity, that European Blackletter was thrown out and a new kind of handwriting called Humanist Minuscule was developed. The historians of the time mistook the 9th century Carolingian manuscripts for original Roman manuscripts, and therefore based Humanist Minuscule off of the Carolingian style, believing that they were recreating Roman handwriting, rather than early Medieval. Humanist Miniscule; a handwriting developed by Italian philosophers in the 1400s, who revelled in their ancient Roman heritage. The new style was popular in Italy, but failed to win fans further north into the Europe, and by the time printing came around Blackletter was still the accepted traditional style of font. Printing with movable type was first introduced in the late 1430s, no more than a couple of decades after Italian intellectuals had devised the Humanist style. 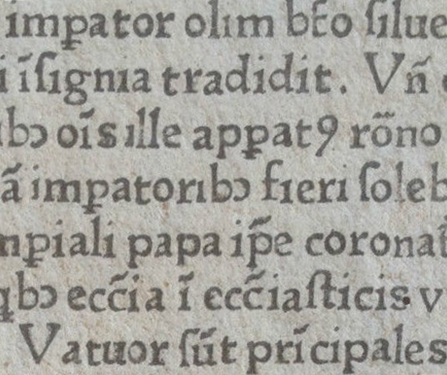 It was another thirty years later that, in about 1465, the first Humanist font face was developed for printing. This Antiqua style was pioneered by a man called Nicholas Jenson, a frenchman living in Venice, who carefully combined the fine style of Humanist Minuscule and the austere font used on ancient Roman inscriptions. It was possible that he was encouraged by, or at least discussed the idea with, a visiting German printer called Adolf Rusch, who only a few years later began printing books from his own press in Strassbourg using a similar Roman style font. However, these early Roman fonts were actually quite unpopular, and, similar to the Humanist style they had been based on, failed to win fans amongst the traditionalist churches and noblemen of Europe. It wasn’t for another hundred years before Roman fonts had been adopted for a significant part of printed works; and important texts such as bibles continued to be printed in Blackletter fonts for a good century more. 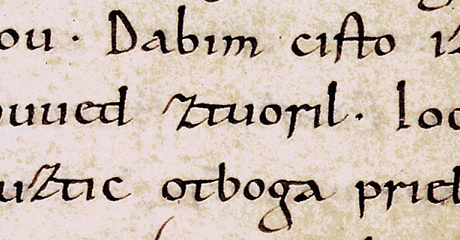 Rusch’s 1470 Roman style typeface, based on Humanist Miniscule. The style of font was refined a bit, and by the mid-eighteenth century numbers had moved from a more medieval style into the style we are more familiar with today. But, basically, anyone looking at any of those early Roman fonts wouldn’t find too much different between them and fonts found in books of the nineteenth century, and even occasionally today. It was only in Germany that the old Blackletter fonts still resisted the Roman style reforms; it began when printers started using Roman styles for books in Latin, and Blackletter for books written in German. This meant that by the nineteenth century Blackletter had become somewhat of a nationalist icon, and the use of any other font could make not only a printer, but the book that used the font very unpopular. Blackletter was even still being taught in German schools in the early 1940s, and as the Nazi cause grew so did the font; a symbol of German nationalism. However, it turns out that Hitler himself was not a fan of the font, and in 1941 it was banned entirely from being used in printed works. The typeface was adopted again for a short while after the second world war, but the few years that it had been absent had had their affect, and it very quickly fell out of fashion. And finally, five hundred years after Italian Humanists had first introduced their Roman style letters, it had spread to pretty much every publishing house in Europe. So now we come to Times New Roman itself; commissioned in 1931 by The Times to replace its rather outdated font that it had been using for many decades beforehand. The Times used it until 1972, when they updated it again, but the font was adopted by Microsoft, who packaged it with their early word-processing software. The attractiveness of the font meant that not only businesses adopted it, but students, educational bodies, writers, publishers, and all sorts of people and groups who create so much of the world’s printed works. And that’s it, from the Roman slave who had to paint stencils of letters for the stone-carvers, to the Italian Humanist philosophers of the renaissance, and even to the Aberystwyth student finishing off their essay at the last minute; our Times New Roman, it turns out, has quite a rich history indeed! *I should think I’ll post on them some more some time. We’re back with ghost walks around Maldon this Easter! This time they’ll be running between the 9th and 26th of April on Wednesday and Saturday nights, starting at 7:00pm. As usual, we will be meeting next to All Saint’s war memorial. This Easter will use the 2013 script, and the 2014 script will be ready for new walks this Summer! Just about two weeks ago now, I bought myself a copy of Dryden’s translations of Juvenal for 99p; one of my many purchases of a suspicious book that no sensible book collector would touch. Indeed, the copy was sold to me without a title page, with the binding completely broken and ruined, and the dealer claiming it was printed the year before the first edition. As it turns out, I’ve acquired a sixth edition printed in Dublin in 1732/3, probably, in all honesty, worth what I paid for it; barely even a reading copy since just to look through the pages meant that the text block would break up and deteriorate even more. So I thought I’d post about how I went and restored it. 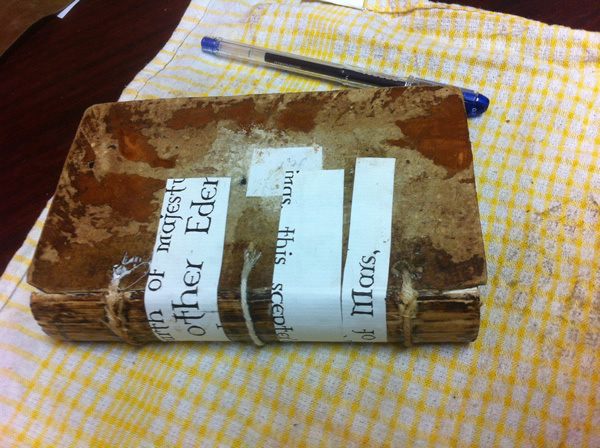 Firstly, I carefully stripped down the book; the odd remaining battered piece of leather came off, and all the old glue was carefully washed off of the boards. The paste-downs (those bits of paper glued onto the inside of each board), I carefully removed so that I could put them onto the new binding later. 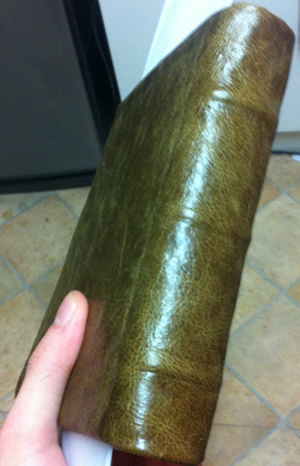 Next I needed some leather to cover the book, so I picked out a nice piece of green-ish leather and drew out the shape of the book onto it. Next, using my Paring Knife, I thinned the leather for the edges of the boards, on the parts that will cover the bands, and on the top and bottom flaps that will go under the spines. 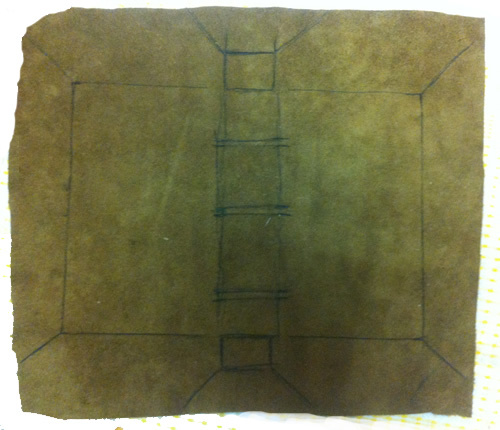 I also cut out the trapezoids at the top and bottom of the spine, and cut along the diagonal lines at each corner of the leather. Fitted over the book, it looked like the left image above, and after some glueing became more like the right image above. The diagonal lines at the two corners are cut at 45 degrees to the boards, rather than at 90, so that the leather overlaps at the join. All I did next was just paste the old paste-downs that I’d removed at the start over the internal side of the boards. 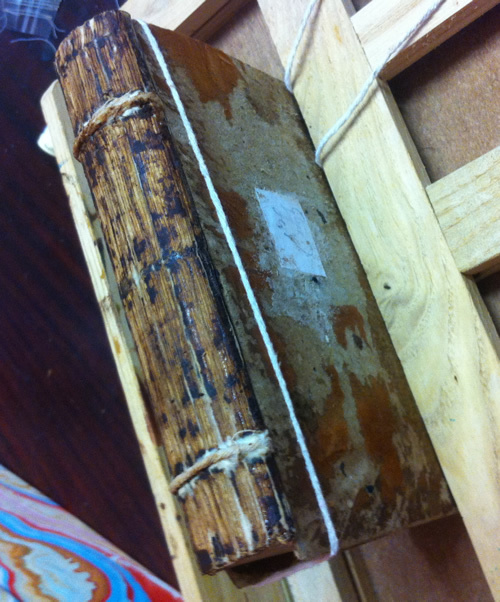 It’s a functional binding at least, but maybe not as pretty as it could be. So I heated up some tools, and tooled ‘in blind’ (or without any gold leaf) some lines above and below each band, tapering to a point within each board. I also cut out rectangles from the scraps of leather I’d recovered from the old binding, and tooled some gold letters onto these to create spine labels. Yeah, plenty of empty beer bottles and firewood in the background. 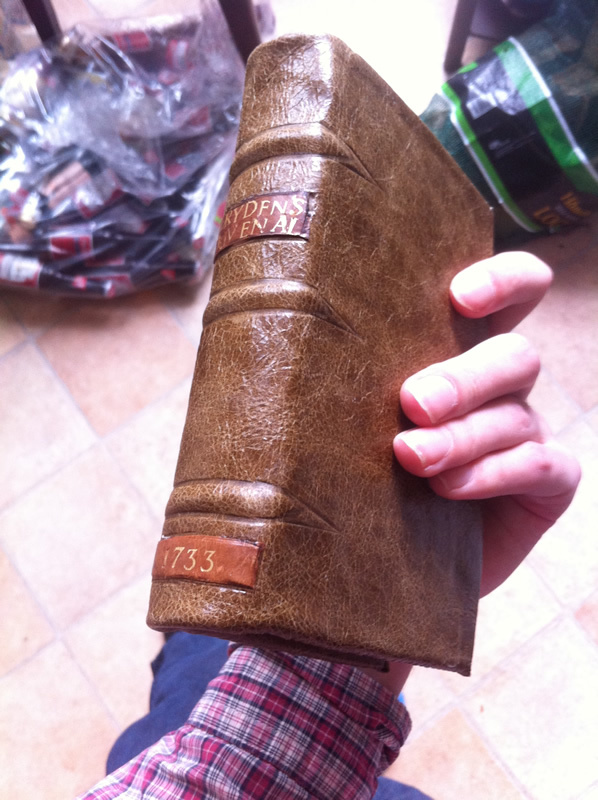 The characters are not completely straight, since the book dates from before typesetters were invented, so to create a proper binding that respects the age of the book it seemed best just to tool the letters individually, as was the practice in 1733.